CPCA-Te Rawhiti Community Pest Controlled Area (the red part around Hauai Bay). The buffer has been established under the guidance of pest-control experts from the New Zealand Kiwi Foundation (NZKF), Northland Regional Council (NRC) and Department of Conservation (DOC). The combined mainland buffer has now been fully operational for about two years. Project Strip is the first line of defence for the pest-free islands and is funded by the EBoIPS – the Eastern Bay of Islands Preservation Society. Local people from Rawhiti (Ngati Kuta and Patukeha) are employed as trappers by Te Rawhiti Enterprises Ltd (TREL) to service Project Strip. John Booth (Mainland Pest Control Co-ordinator for EBoIPS), administers the project and John Clendon and Rana Rewha are the main trappers. Project Points’ traps and bait stations at Omakiwi, Orokawa, Kokinga and Omarino peninsulas are also serviced about fortnightly, all but those at Orokawa by the landowners’ own trappers or by TREL with funding from the landowner. Orokawa is presently serviced by TREL, largely from DOC grants, but will eventually be funded by the landowners themselves. The Te Rawhiti Peninsula CPCA is also a crucial part of the mainland buffer, established in 2009 by NRC and serviced by locals with financial assistance from the landowners. 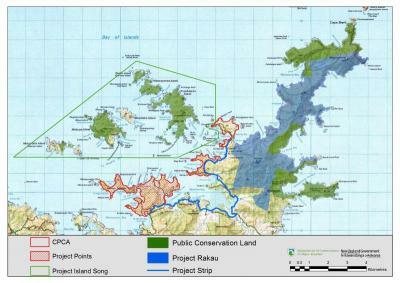 The fourth project is the Cape Brett (Rakaumangamanga) Peninsula (the large blue area on the map). The Te Rawhiti CPCA, together with Nga Whenua Rahui and DOC are working with local hapü on pest eradication on the Cape Brett peninsula. The main trappers here are Alvin Rewha and Darryl Collier. Over the last 2 years, Francis Hepi and Iti Arama and others worked out there but funding has reduced so they are working in other jobs. Nga Whenua Rahui has been a major contributor for the 3B2 Trust lands and DOC for the DOC estate. 3B2 Trust who own the lands have loaned money to keep its lands pest free but expect their money to be repaid. Funding is being sourced for the DOC estate as their funding is minimal this year. The Te Rawhiti CPCA, now in its fourth year, has a network of bait stations and kill traps targeting mustelids, rats and possums spread over 460 hectares. This significantly reduces the chance of reinvasion by animal pests to the islands of the eastern Bay. Rana has been doing a great job. We are all looking forward to the day when the birds that used to be in Ipipiri return there under their own steam, or can be helped back. The better we work together at keeping these islands rodent- and stoat-free, and the pest numbers low in the mainland buffer, the sooner that day will come. The challenge now becomes how we extend that good work and how far back can we push to extend the control. This depends on funding. 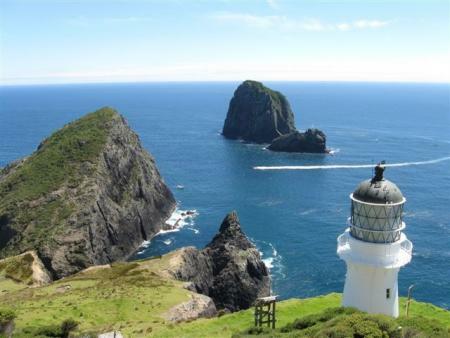 Project Island Song – the pest-free islands of the eastern Bay of Islands, is two years old. Eradication of rats, stoats and mice on Motuarohia, Moturua, Motukiekie, Urupukapuka, Waewaetorea and Okahu Islands was carried out in June 2009. Project Strip has 103 rat snap traps, 39 DOC 200 stoat traps, and 34 Timms possum traps along 13.4 km of Rawhiti and Manawaora Roads. The GPS-located traps are cleared and serviced fortnightly (three-weekly in late spring) in line with DOC Best Practice.